The Cagayan is the longest river in the Philippines. The Cagayan River in Nueva Vizcaya Province. The Republic of the Philippines is located in the western Pacific Ocean and is made up of 7,641 islands. It has a population of 100,981,437 people, with the Visayan and Tagalog peoples being the largest ethnic groups. The capital city is Manila with Quezon City being the most populous. The highlands are mountainous and of volcanic nature and are covered by tropical rainforest. The country experiences a tropical maritime climate which is hot and humid. Notable physical features include Mount Apo (the county's highest peak at 9,692 feet), the Philippine Trench, the San Juanico Strait, and the Laguna de Bay. The River Cagayan is locally referred to as the Rio Grande de Cagayan. It flows from the Caraballo Mountains covering 314 miles to the Babuyan Channel into the Philippine Sea, with the water generally flowing from south to north. This river experiences severe flooding due to high rainfall of up to 300 millimeters annually and surface retention that causes the water to move slowly. Valleys along the river are very fertile, and farmers grow rice, coconut, citrus and tobacco. There are two dams which have been built on two of its tributaries. The national government has developed tourism along the river. The Ibanag community derives their name from the river’s former name, Banag. The river has a wide variety of fish including a rare riverine fish locally known as ludong (Cestreaus plicatilis).To save the ludong spawns from extinction, local and national governments have imposed a ban its fishing which has been ignored by the locals. The River Agusan flows 217 miles along the Compostela Valley and drains into the Butuan Bay. 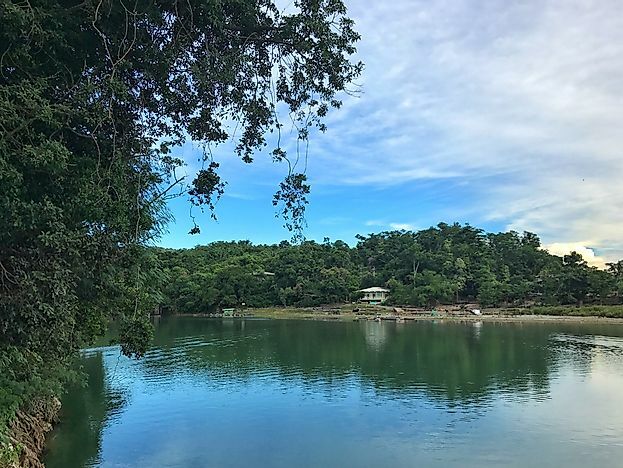 The most illustrious feature of this river is the Agusan Mash which covers 19,197 hectares. It serves to reduce flash floods. It is home to over 200 bird species and many other endangered species of plants and animals. It has been declared a wildlife sanctuary. Communities found along the river include Mamanua, Manobo, Mgahat, and Mandaya. Their economic activities are farming and subsistence fishing with rice being the leading food crop and coconut the leading cash crop. The River Pulangi is the largest tributary of the River Mindanao. It stretches 199 miles and has the largest watershed in Philippine covering an area of 1.8 million hectares. A power station has been built along the river with a production capacity of 255 megawatts, and another one has been proposed with a projected capacity of over 300 megawatts. This project has sparked opposition with some arguing that the dam would submerge the grave of ancient ancestors known as Apo Mamalu. The indigenous people are also unhappy with the construction of the dams arguing that it will erode their culture. The waters of the river are utilized for agricultural irrigation and domestic use. Tributaries feeding the river include the Manupali River, Muleta River, Bobonawan River, Tigwa River, and Bukidnon River. The source of this river is in the Sierra Madre highlands and it drains into Manila Bay at Bulacan, covering a distance of 162 miles from its source to its mouth. Its tributaries are the Rio Chico, the Penaranda River, and the Coronel-Santor River. The river basin experiences annual floods which result in destruction of property and loss of life. The worst flood occurred in 1972 where the entire Pampanga, Bulacan, Nueva Ecija and, Tarlac provinces were submerged. Three dams have been constructed along this river, and they provide water for irrigation to the residents of Nueva Ecija province. At the lower end of the river, the water is used in fish farming and a newly constructed irrigation scheme. This page was last updated on July 24, 2018.